The final order date to ensure that your Reply Letter from Santa is received pre-Christmas in the UK is 12:00 on 19th December 2019. For international orders, please refer to Royal Mail's last posting dates. We regret that we cannot guarantee delivery of your special Reply Letter from Santa in time for Christmas if your order is received after these dates. We cannot accept responsibility for delays outside our control - such as strikes or delays in delivery by Royal Mail. Once letters have been posted by us, title is passed to the customer. Letters are posted using standard Royal Mail delivery and any queries relating to delays in delivery should be directed to Royal Mail. We may, at our discretion, as a gesture of good will, resend letters which are not delivered within 14 days of being posted. We hope you will be delighted with your Reply Letter from Santa and free 'Reindeer Dust'. However, in the unlikely event of your letter arriving in a damaged condition we will send a replacement letter or issue a refund at our discretion. Should you be unhappy with your Reply Letter from Santa or the service received from us please contact us with your order reference and a brief explanation of how we could make improvements. We may then refund your payment. We will deal with any complaints in an appropriate manner and aim to respond within 2 working days. If you wish to cancel your order, please contact us with the order reference and your instruction to cancel. We regret we can only issue a refund if the request to cancel is received before your order has been processed. An order is deemed to have been 'processed' when the letter has been printed and placed in the sack ready to be delivered to the Post Office. From the middle of November onwards this is likely to be within a very short time of your order being completed as we try to process orders as quickly as possible so they are posted promptly. This website is run by Yule Love This. Yule Love This is registered under the Data Protection Act (1998) Registration Number Z2442169. We control and operate the website from our offices in England. Accordingly the laws of England and Wales govern claims relating to, including the use of, this web site and the materials contained therein. If you choose to access our website from outside England and Wales you do so on your own initiative and you hereby agree that in the event of a dispute between Yule Love This and you the laws of England and Wales will apply at all times. Any contract will be deemed to have been concluded in the United Kingdom. Further, any such contract will be interpreted, construed and enforced in accordance with the laws of England, and you and Yule Love This irrevocably submit to the non-exclusive jurisdiction of the English Court. By submitting your order to Yule Love This, you acknowledge that you have read, understood and will abide by these Terms and Conditions. Payment will be taken in full at the time of ordering. The prices listed on the site are in UK pounds (GBP). We reserve the right to change any advertised price at any time. The length and quality of the Reply Letter from Santa is dependent on the choices you make and the accuracy of the information you enter when placing your order. Whilst we make every effort to ensure that this information is correct it is your responsibility to ensure the accuracy of this data at the time of entering it. You will be given a preview of the content of the letter and the address to be printed on the envelope before making payment. We regret that we are unable to offer refunds where a complaint is about the look of the letter due to the data entered by yourself, or where delivery is delayed - or does not happen at all - due to inaccuracies in the address given. By placing the order you will have confirmed the accuracy of the content of the letter and that the address that the letter is to be sent to is correct. If you wish to make changes once your order has been accepted, please contact us immediately and we will endeavour to help wherever possible. Any amends will be at our discretion and may not be possible if your order has already been processed. 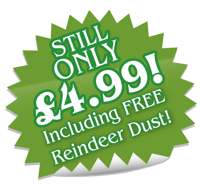 We probably don't need to tell you this, but as the Reindeer dust contains glitter it must not be eaten by humans of any size! The contents of the sachet are either standard porridge oats, flaked barley or rolled oats (used for horse feed) and glitter. We endeavour to ensure the complete accuracy of the content of this website. However, some prices or details contained on this site may change from time to time and it is possible that errors will occur. We will make every effort to correct any errors as swiftly as possible but we cannot be responsible for any losses incurred as a result of errors. To the maximum extent permissible by law, we exclude all warranties, express or implied as to the accuracy of the information contained in any of the materials on this website. We cannot accept liability for any particular material on the website or as a result of any use of, or reliance placed upon, the information contained on this website. Any material downloaded or otherwise obtained through the use of this website is done so at your own discretion and at the risk that you will be solely responsible for any damage to your own computer system or loss of data that results from the download of any such material. This website is operated on an internet-only basis and you are welcome to ask us any questions you may have through our contact form. In the event that you wish to write to us, please address your correspondence to Yule Love This, 1 Willow View, Kislingbury, Northants NN7 4AU. You can e-mail us by clicking here.